"Goalie Joe Lech in Action"
Photograph of UND Hockey goalie Joe Lech (1) defending the goal. 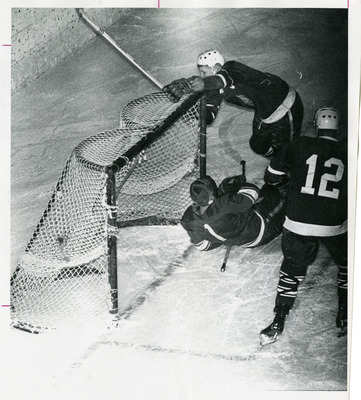 Lech was the UND netminder from 1962 until 1965 and was a member of the 1963 NCAA Championship team. Hailing from Saskatchewan, Lech played in 80 career games and registered a save percentage of 89%. This photograph can also be found in the 1965 Dacotah Annual, page 85.